﻿ Bouncing Back: How Do Population Dynamics and Social Cohesion Affect the Resilience of Societies? Bouncing Back: How Do Population Dynamics and Social Cohesion Affect the Resilience of Societies? “What often gets missed in that conversation is the social dimensions of resilience,” Mazur continued. In other words, what makes some communities recover from disasters more quickly and completely than others? Morrow drew from examples of communities that have not responded well to disasters to highlight elements of resilience. One factor she emphasized was the importance of accurately understanding risk. This is very hard for people, she said. For example, she found that almost 50 percent of people living in areas vulnerable to storm surge from North Carolina to Texas thought that such surges were not very or not at all likely to hit their homes. The pervasiveness of this kind of misinformation can be a significant cause of mortality when natural disasters strike; families who don’t believe they are at risk won’t leave before a storm strikes. For some, however, it is lack of capacity that makes them vulnerable. There is “unequal exposure to risk” among economic classes, Morrow said. “More poor people live in flood plains than anyone else,” for example, and they have fewer resources to cope if and when a disaster does strike. Some 100,000 people in New Orleans lacked transportation during Hurricane Katrina, for instance, unable to leave the city on their own, she said. “Community resilience and sustainability are certainly tied to how we use our resources, how they are distributed,” she said. Resilient communities, on the other hand, also have specific characteristics. “Social networks and connections are so incredibly important,” Morrow said. One Vietnamese community in New Orleans stayed connected through a single Catholic priest, who acted as a node of communication and organization, even after evacuation. One year after the storm, 90 percent of the 900-strong parish had returned to the city. That return percentage was “pretty unheard of,” Morrow said. Dr. Elizabeth Malone of the Joint Global Change Research Institute began studying social resilience after working on a study measuring vulnerability to climate change. Instead of continually focusing on a “deficit concept” like vulnerability, she thought it might be better to study the strengths of communities and societies. Malone decided to look into a component of climate change resilience that has been infrequently studied: family planning. The climate change community has generally used population projections uncritically, she noted, without considering what the impact of higher or lower fertility would be on communities impacted by climate change. (The most common usage is citing the UN’s medium variant world population projection as fact.) But future population projections are dependent on many factors that are subject to change, like contraception prevalence rate, and in turn, changes in population dynamics can change important assumptions about climate change too. Malone decided to measure the economic growth and resilience of seven countries under two population scenarios to see the differences: the medium population growth projected by the United Nations and a scenario in which each country will achieve universal access to family planning by 2050. Resilience was measured by combining food security (factors like cereal yield and malnutrition prevalence for children under five) and environmental capacity variables (population density, percent of agricultural land area, and population in the largest city as a percentage of the urban population). Looking at Bangladesh, Nepal, Haiti, Ethiopia, Kenya, Malawi, and Uganda, she found that in all of them, resilience was higher under the universal family planning scenario than under the medium population projections. De Souza said that PAI’s success in combining family planning advocacy with longer-term resilience efforts has been greatly dependent on the country. PAI’s work in the Philippines was shaped by the recent passage of a reproductive health bill which provides free contraception to poor women (although enactment of the bill has been temporarily frozen by order of the Philippine Supreme Court). Access to contraceptives in Manila, the capital of more than 1.6 million people, has been severely restricted since an executive order banning them from city-run clinics in 2000, and access to contraceptives is low across the country. PAI helped bring together policymakers to discuss the opportunities presented by the new bill, which was and is the subject of a furious national debate, including the ramifications it will have on adaptation to climate change. He added that although many of the regions PAI works in are vulnerable to the effects of climate change, they have made a concerted decision to work on building long-term resilience – in part due to feedback from communities. As climate change brews bigger, more destructive storms and population growth and urbanization cluster more people in urban areas, society’s vulnerability to disasters is growing. But “it’s important to keep in mind that humans are nothing if not resilient,” said Mazur. The lessons humanity has learned from past disasters remain “in our most enduring social structures” and will help us cope with future changes. Sources: The New York Times, UNFPA. 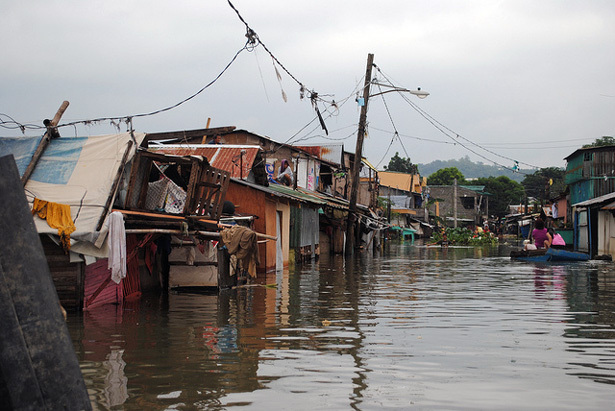 Photo Credit: “Philippines Flooding,” courtesy of Arlynn Aquino EU/ECHO. Very useful post for teaching purposes and to support student research on dealing with extremes in urban settings in a warmer world. Isn’t what he’s talking about, social cohesion, resilience, etc, the same thing called Social Capital? Look it up.